There is a need for fitness professionals, and especially personal trainers, to understand the implications of embodiment as a mind-body-spirit energetic continuum. How you live in your body directly impacts who you are as a Self, and vice versa. The techniques showcased in this course include Chi self-care, Chakra-activation postures, Meridian-stimulating postures, The Five Tibetans, Ascending Energy, Descending Energy, Somatic Symmetry, Somatic Shielding, and Pose/Counter-pose Yoga, all of which emphasize vitality, longevity, and personal maturation by balancing and optimizing bio-energies for full-spectrum wellness. These simple, practical techniques help minimize or eliminate the problems of poor fitness, chronic pain, faulty function, objectionable appearance, noxious self-concept, and negative repercussions of stress. This course will help you and your clients understand the benefits of taking a pro-active, preventive approach to health and fitness by cultivating energy-enhancing and energy-conserving habits that support wellness over the course of a lifetime. 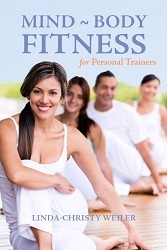 Available course credits for the Mind-Body Fitness for Personal Trainers course.